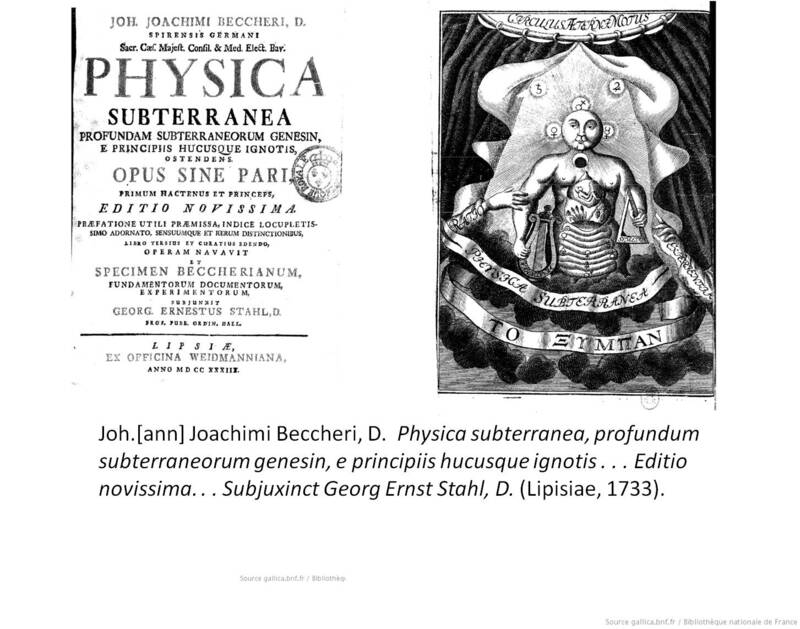 Another possible theory for disease that Osborn may have been aware is the Phlogiston theory, proposed by Johann Joachim Becher in his book Physical Education in 1667 . Derived from a Greek term with the same phonemic spelling, “phlogiston’ comes from ‘burning up’, a phrase he used in reference to the remove or elimination of a substance by fire. Becher took the traditional theory of four elements and eliminated from it the air and fire, referring these to specific parts of the combustion process. Becher in turn redefined the earth or terra into three parts–terra lapidea, terra fluida, and terra pinguis–referring to stony earth, fluid earth and fatty earth. Becher’s terra trine bears some resemblance to the trine of Paracelsus, with terra lapidea referring the earth, terra pinguis referring to sulphur, and terra fluida referring, in part, to mercury. Due to its trines,’ this theory may have been popular to some. It had some relationship to the trine-based traditions heavily promoted by the popular Seer amongst Dutch colonists in New Netherlands, Jakob Bohme, and could easily be equated with other trine-based traditions so popular to metaphysical science, enough to provide physicians like Osborn willing to take in these concepts as part of his philosophy, to equate them and interrelate them with other practices he may have been engaged in with medicine in the Bohmite alchemical sense–the belief that emotions and spirits are in part driven by these rules–or the purely scientific sense, in which some sort of physical and chemical balance is what is being achieved when the doctor makes use of this philosophy. Much like Bohme, Becher has enhanced the traditional metaphysical teachings of the earth, to relate them to the human body (the macrocosm-microcosm relationship Bohme like to emphasize). His more important and perhaps most detailed writing on the role of fire Physica subterranea, profundum subterraneorum genesin, e principiis hucusque ignotis . . .Editio novissima. . . Subjuxinct Georg Ernst Stahl (Lipisiae, 1733). (See Gallica Biblitheque Numerique, see http://gallica.bnf.fr/ark:/12148/bpt6k84226t). This work proposes a theory for the universe, plants, and earth and their various natural events, focusing on the metaphysics of creation, movement, and change, but in a sense that focuses on the elements that define each body or corpus of existence. This approach to the theory of development in turn has obvious relationships to people and other living objects, and so it has a certain amount of reasoning that can be assigned to the metabolism and physiology of the body. The forces that determine events that are engaged in by matter, take place regardless of the type or form of matter under this influence. This gave way to some biological applications of this theory in medicine, which took a strong hold by the beginning of the next century. Around 1700, Becher’s Terra pinguis underwent a transition relating it directly to the body and to the medical condition the body was in, its vitality so to speak. In 1703, Georg Ernst Stahl converted the terra pinguis into the actual term phlogiston and claimed this to be some sort of ingredient that was in every object, and that it could be emitted by fire. This loss of phlogiston was clearly defined in an article entitled “The doctrine of Phlogiston reviving” published in the Medical Repository (v. 1, p. 20). “Of the great theories, the phlogistic, or the German doctrine, and the oxygenous or the French, have been the most distinguished. Beccher and Stahl were the authors of the former. They supposed that during the burning of bodies something volatile escaped and flew away. From the observations they made on bodies undergoing decomposition by fire, they justly concluded that these contained an inflammable principle. To this they gave the correct and appropriate name of phlogiston. But as sulphur, coal, phosphorus, iron, zinc, and several other bodies were inflammable substances, those chemists were puzzled to tell what their phlogiston was. For want of such a definition they bewildered themselves and their followers. Once a substance was freed of its phlogiston, this “dephlogisticated” material known as the calx had its own unique properties and qualities. If an object was burned in air with ample capacity to absorb all of the phlogiston that was emitted, the object would burn until it became true calx. Objects that emitted large amounts of phlogiston were extinguished fairly rapidly, due to the inability of air to consume or take in and store all of the phlogiston. Phlogiston was the antithesis to the true nature of the air existing above the fire–the existence of the later discovered substance oxygen. During Osborn’s later years in practice, around 1772, two other scientists, Joseph Black and Daniel Rutherford, used the phlogiston theory to explain why they could show that an air exposed to the fire fueled by a combustible material ended up rich in mostly nitrogen and carbon dioxide (the relationship of oxygen to this process was not yet discovered or proven). During Osborn’s peak years of his practice, he may have also heard about another theory proposed by Russian scientist Mikhail (Mikhaylo) Vasilyevich Lomonosov (1711 – 1765), who was unable to duplicate Robert Boyle’s experiment used to prove that phlogiston existed. This led to a conclusion drawn by Lomonosov stating the phlogiston theory was no longer valid, and that the relationship between fire and metal Boyle proposed was in error. In the remaining days of the eighteenth century, only a few chemists applied the phlogiston theory to their experiments and findings, these chemists were for the most part concentrating upon the combustible gas hydrogen, the only gas remaining that could be shown to feed fire. Still, Osborn was a chemist or iatrochemist, which means the theory of phlogiston, whether he knew it as such or not, played an important role in the formulation and preparation of some of his remedies. Certain events of change in structure and form have traditionally been related to the chemical principle of fermentation. Fermentation was known to change the condition of various concoctions over time, and was applied to the body as well in some theories as to how and why the body changes with time due to disease. The fermentation of food within one’s stomach or gut was often conceptualized mentally to provide someone with a picture as to what his or her disease must look like and what it must be doing inside to cause such malaise at times. Phlogiston theory places an emphasis on the role of fire in the chemical process, and its ability to change things through combustion. This combustion theory could also be related to the vital processes and gave rise to various philosophy about what the exact steps of metabolism or change are, both in the body and out. Relating each of these to the more traditional iatrochemical concepts of pyrrolatry that Osborn adhered to, and the possible use of natural sources for forces other than fire to carry out similar processes, we have to conclude that Osborn had a lot of metaphysical traditions underlying the steps he took in making his medicines. Apparently Osborn felt that making medicines was not always just a chemical process for one to engage in. For Osborn, one of the more important relationships between fermentation, combustion and metabolism had to pertain to the use of Iron as a medicine. The needs for changing iron into new substances with less phlogiston was the goal, were he to engage in such a practice. such as through the formation of rust. Osborn most likely had plenty of opportunities to play with iron during his years of apothecary and medical practice. We find evidence for this several places in his vade mecum. To activate the water, Osborn heats up a rod of Iron, causing the phlogiston to be expressed. This leaves behind the Iron as calx, which is not used. By quenching the hot iron in the water, its phlogiston (life energy) is expressed into the water, which the patient then drinks. Since the iron is rusty, this allows for some of the rust to be introduced into the water as well, giving it a rich red color. Osborn’s ancient recipe, first popularized by Dioscorides, was still in use by doctors like Osborn in spite of the time that has passed. Due to its nearly identical with Dioscorides formula, we find an early four elements-four humours methodology still in place, due to a slight change in philosophy and metaphysical beliefs. It therefore difficult based on this single recipe alone to state with certainty that Osborn is either a practitioner of the four humours or a practitioner who believed in the phlogiston proposed by Stahl. The features supporting some of Osborn’s recipes as being very much related to Stahl’s writings is the concordance in time of Stahl’s writings with other authors Osborn has cited, in particular Daniel Turner, who was very popular in the 1720s, and Dr. Robert James, the Royal Physician popular several decades earlier as well. This is a unique example of events in medical and chemical history that are timely in how they relate to Osborn’s practice. If Osborn were not familiar with Stahl, we would expect him to be practicing according to the humours theory, with a little traditional alchemy included as well due to George Starkey’s work. But Stahl’s writings might have given physicians like Osborn, who were residing in a largely Dutch environment with strong Dutch heritage and background, a chance to revive the local fame of Alchemy and people like Starkey and Boehme, another Paracelsian-Helmontian popular between 1590 and 1620. This ens veneris or philosopher’s stone contribution to colonial medicine (at least in the Hudson Valley) was very unique, and the region’s overall support for Jakob Boehme’s traditional teachings in “New Age Paracelsianism”, ca. 1690-1710, made the valley the heart of this early American Alchemy tradition. Such a history strongly compares with the similar phlogistic teachings generated around 1667 in this region. [Incidentally, 1667 is the year in which the local Boehmites expected Jesus Christ to return, walking down from heaven through the clouds. Even more importantly, 1667 was to the Dutch the next millennium, a period for spiritual uplift, rebirth, and revival. To the English this symbolic year was 1666.] To see signs of Paracelsianism, Boehmism, Helmont-Stahlism and Starkeyism made for a very rich background of this philosophy for the region. In a true German-Dutch nature, we could argue that this made the region a natural dwelling for some of the first spiritualists and metaphysicians of the early colonies. In no other place did English, Dutch, Belgian, Bohemian, Moravian, and Luxemborg traditions mix as much as they did within a single community.